The Beyonder comes knocking on the door of Nelson and Murdock, Attorneys at Law. What he asks is ridiculous, but maybe not as ridiculous as seizing control of the planet by sheer force of will. Again, I’ve not gotten more than a few glimpses of the character and none of them are the main mini, but it seems like pretty boring stuff. Exactly NONE of what I’m reading makes me want to read any more, even with the Hulk issue and this one. It’s not horrible, and they’ve brought The Beyonder front-and-center, even as goofy as it is, it’s not as bad as some I’ve read. The Beyonder wants to legally and legitimately own Earth. Matt Murdock doesn’t want his filthy money, can’t even be sure he trusts the guy, but The Beyonder’s admiration for Murdock’s sense of justice greases his wheels. 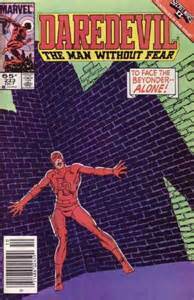 Long story short, instead of money, he gives Murdock/Daredevil his sense of sight back. He and his ladyfriend have one of those movie days where they do everything there is to see, literally. They’re having such a good time until Murdock figures out that he values his sight more than the off-chance that this would compromise his sense of judgement.